Well folks … it is another amazingly, sunny, spring day on Vancouver Island. I am ready to head out to the garden to plant more lettuce, some pole beans and add soil to the potato patch .. but first a blog post! As I was going through my photos, I found this gem and decided to write about how this particular couple lived happily ever after. Is there a Spring or Summer wedding on your calendar this year? Do you need a ‘Farmer’ at your road side produce stand? Building one of these Not-So-Scary-Scarecrows is sure to put a smile on anyone’s face. 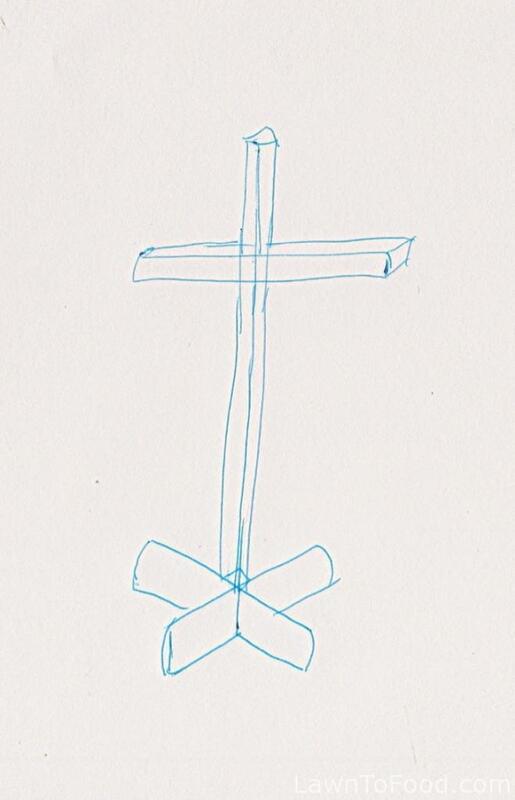 To make your own scarecrow (scary or not), start with a wooden structure to support the clothing and straw stuffed head. Mine looked like this …. After purchasing the appropriate clothing at thrift shops and yard sales, I began assembling the bride and groom-to-be. Deere was fairly easy, I just put her dress over the arm supports. Then proceeded to stuff her bust and arms with straw. I used a large darning needle, with tough thread, to nip & tuck her in the appropriate areas. John took a bit more work to get is legs fitted on to the support … picture a guy who bent over and split his pants open … ya, that’s how I got his legs to look like legs, by putting the support post through the ripped seam of his pants. I stuffed his legs with straw and used the same thread and needle to tuck him in, where necessary. A few screws imbedded in the support post, helped to hold his pants up. His shirt arms were stuffed, and then I used elastic bands to hold the straw in at his wrists. For their heads, I sewed mock “pillow cases”, rounded at the top and narrowed at the neck then stuffed them with straw. This took a few tries to get right. First John’s head was too large, and Deere’s was too narrow, but eventually I got it worked out. A permanent felt marker was used to draw their facial features. Using turqoise and peach (the wedding colors) accessories made the couple really come together as one ♥ Hope that you too, use your imagination to create a scary, or not-so-scary, scarecrow for any funky reason at all. 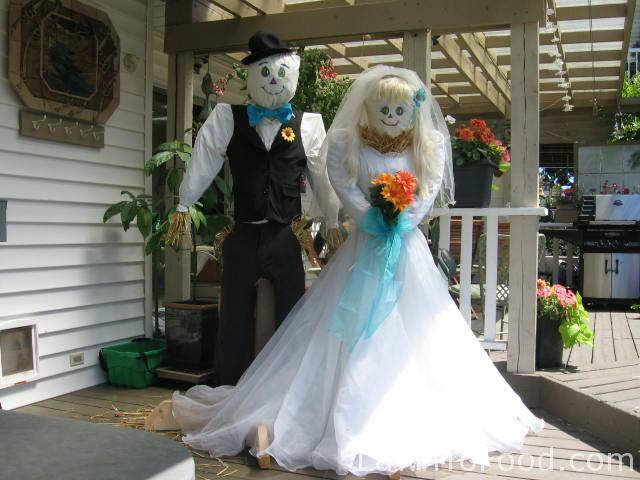 This entry was posted in Cool Carpentry Ideas, Decor & Sewing Ideas, Projects, Recycle Reuse Rebuild and tagged scarecrow, straw, wedding by Lynda. Bookmark the permalink.